One way of describing photography would be to say that it is akin to painting using light to tell a story. So, what does one do when the pivotal ingredient, light, isn’t playing ball. It’s definitely not time to pack it in and call it a day for sure. One can still find ways to make the limited light work for you and achieve results that may not have been possible in broad daylight. What are they, you ask? Well, that is quite a broad range to cover but for the sake of brevity, I will restrict myself to this one – shooting with a slow shutter speed with the intent to capture motion. After a couple of hours of silence with no shutter-sounds to break the incessant clatter of the rains on our vehicles, we reached Kuikhola, a small stop on a bend with a few shops where one could have a chai and momos on one side of the road and look at a waterfall on the opposite side. With time hanging heavy on our hands, we decided to wait here for a while in the hope that the skies will relent and we find a break. 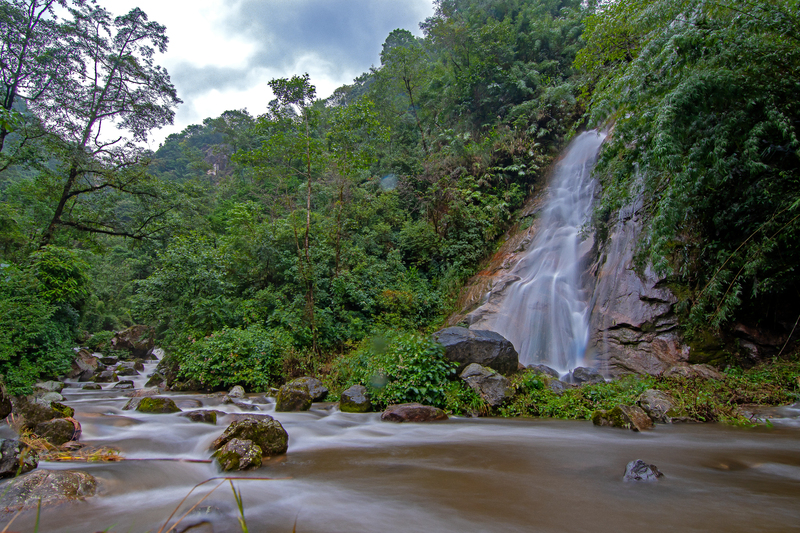 No such luck – so after my 3rd cup of chai, I decided to walk over to the waterfall and evaluate what I could do. By now, it had got quite dark and it was also close to sunset and I reckoned that the light was low enough for me to try a slow-shutter frame of the waterfall. It wasn’t just a waterfall though, there was another branch of water that was cascading through the rocks and joining the waterfall at the base – so, double the action on water would make for an interesting frame by itself I thought. Now, for the how. Given the speed of the cascading water flowing over the rocks, I felt that a shutter speed between 3 & 5 seconds would be appropriate to achieve the smoothness and milkiness in the results I was looking for. Plus I wanted as large a depth-of-field as was possible. So I dialled in an aperture of f/13 and adjusted the ISO down to 200, the combination giving me a 4s exposure for the frame. Obviously, for such a large exposure time I needed to support the camera – I found some rocks on which I could plonk it, adjusted the camera for the frame and horizon-line and reeled off a few shots. Viola, there you have it, a nice slow-shutter frame of the waterfall and the cascade at Kuikhola.